Shedhalle, St. Pölten: On a clear and cold afternoon in late November 2012, a group of people gathered in front of the gates of BMUKK1 Prater studios, waiting for the curator Ursula Maria Probst to take them on a guided tour through a number of ateliers belonging to young aspiring- or prominent artists. Situated in Vienna’s second district in the immediate neighbourhood of the famous Ferris Wheel, the 25000 m² large property whose artistic history can be traced back to time of Vienna’s World Fair in 1873, this is a place of astonishing beauty where old architecture and greenery embrace constantly growing collection of artworks in an open space. 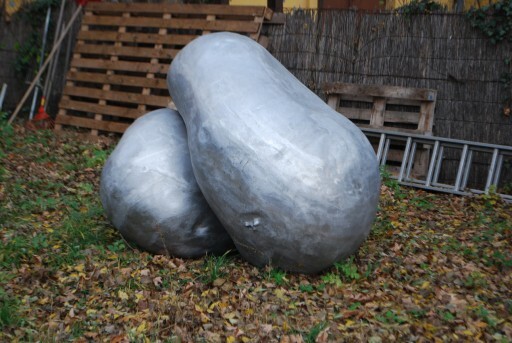 It is there, surrounded by trees and flowers, that Hans Kupelwieser, one of the famous BMUKK Prater occupants, worked on his untitled C-prints (2010) of landscapes mirrored in the dented surface of polished-steel sculptures which are now part of his large solo exhibition “Reflections” in the Shedhalle in St. Pölten. It is more or less because of him that I was assigned to this tour: curious to cast a look “backstage” before going to see the show in St. Pölten. Hans Kupelwieser welcomes us in a small garden facing the main entrance to his studio. Before letting us in, he points, one by one, at sculptures scattered around, explaining the process of their creation. 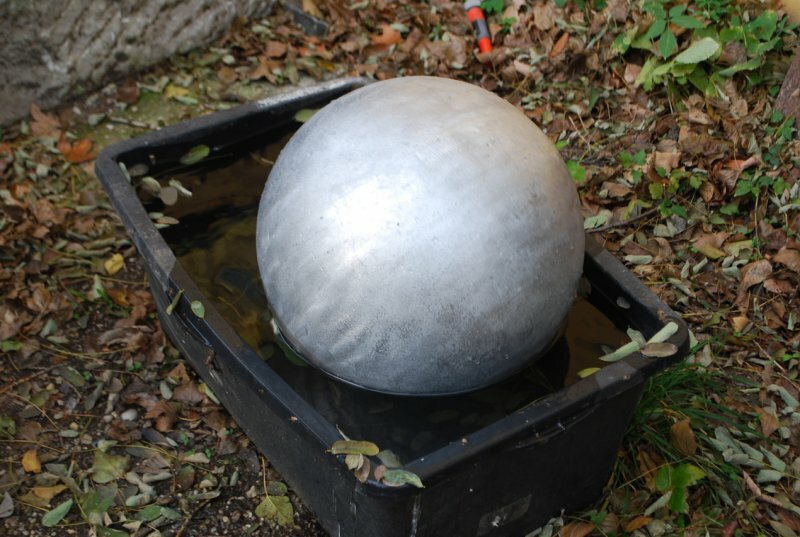 One of the visitors stares confusedly at something that looks like a metal ball floating in the rainwater-filled clay trough. Kupelwieser seems amused by his obvious dilemma: “It’s just a hollow aluminium cast. 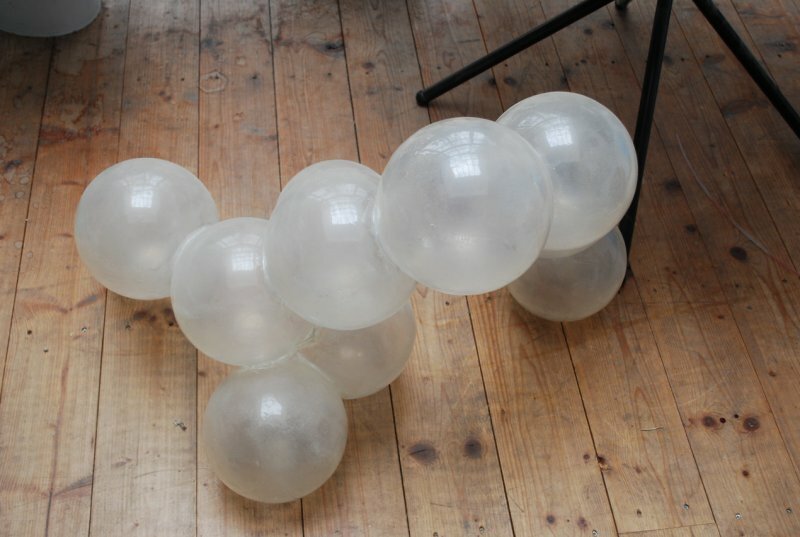 Try to move it – it’s as light as a feather!” As I enter the spacious studio, I realise that the curator became “over-curated” by the artist, obviously used to guide through his own working premises. Days later while going through the exhibition in the Shedhalle, my thoughts of the precious hour spent in Kupewieser’s Vienna studio surfaced. 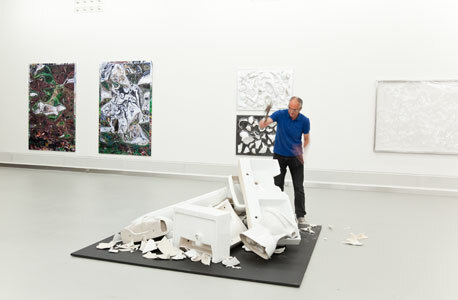 Without going through that experience I would have never understood the full concept of his work – “Folded Coray” (2008), a complex transformation of a three-dimensional chair designed by the Swiss designer Hans Coray (1939) to a flat shadow cut from aluminium and folded and yielded multiple times into a relief object mounted to a wall, facing the viewer. 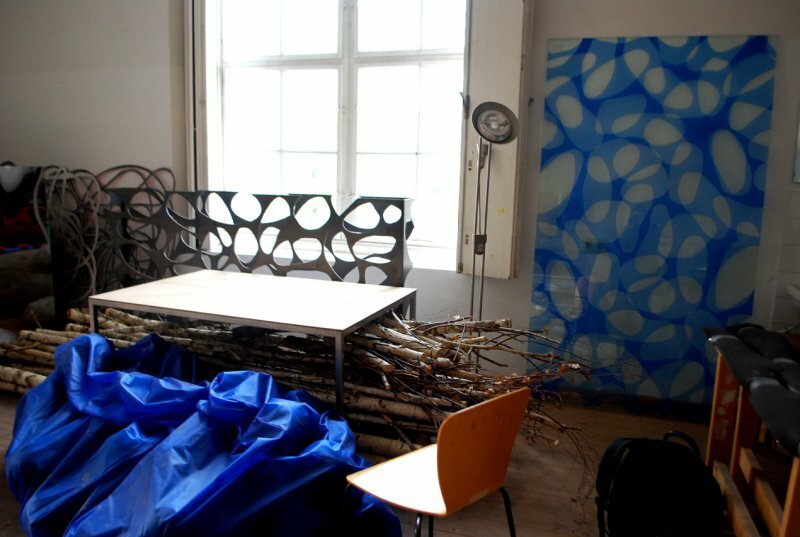 One of this art piece’s working versions is still hanging on the wall of Kupelwieser’s studio, along with an example of the further project development – Kupelwieser has made the same aluminium chair turning on a rotating platform in front of the running camera. 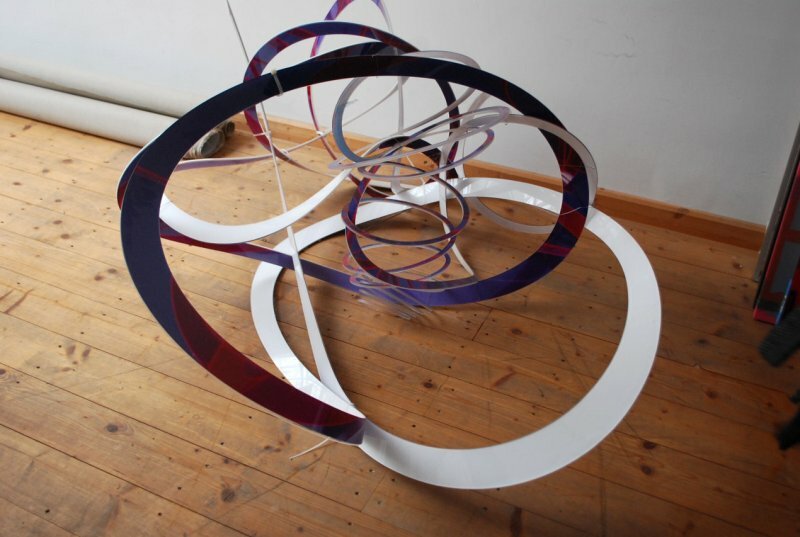 This process has resulted in a photograph with the self-explanatory name “Spinning Coray” (2009), an inkjet print on deckle-edged paper on aluminium which shows the interesting change of contours caused by fast movement, its only hint about the nature of the shown object being given in the title of the artwork. 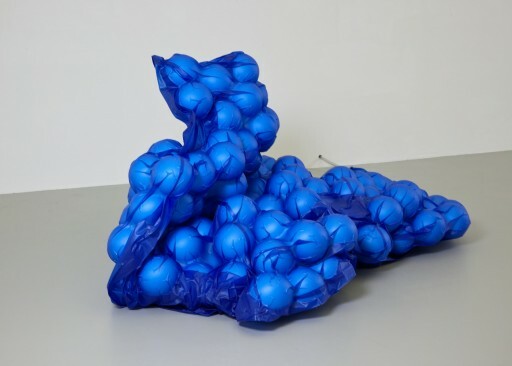 Hans Kupelwieser has curated his solo exhibition “Reflections” in St. Pölten, which establishes connection between his early and recent works. 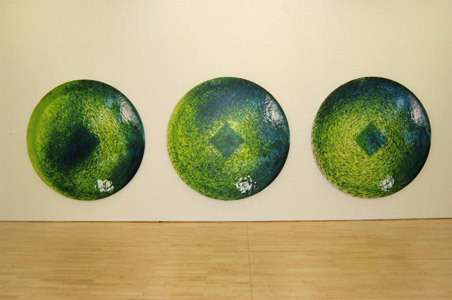 Visitors are introduced to some of the most important works by the artist; famous for his unique ability to switch from two- to three-dimensionality and vice versa by experimenting with media, materials and techniques. He juggles with kinetic, pneumatic, architectural and linguistic elements creating sculptures, arrangements, objects and installations using a broad palette of natural and industrial materials. 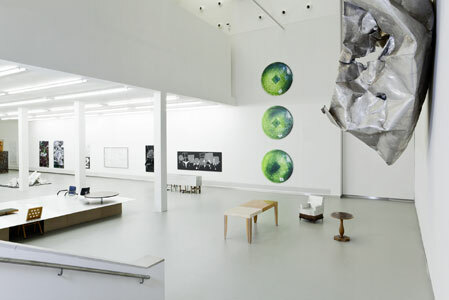 The works by Hans Kupelwieser on display in the Shedhalle (architectural ensemble with the Museum of Lower Austria built by Hans Hollein in 2002) span from early photographic works and experiments with clothing items, and polyester turned into wall objects to his post-medial sculpture and architecture. 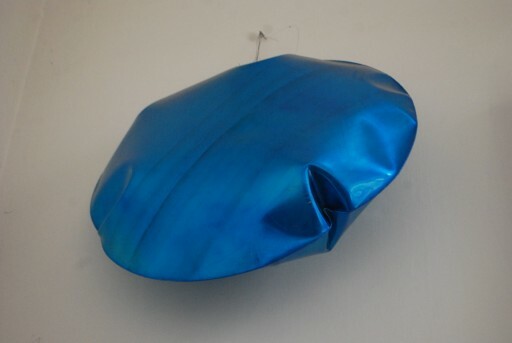 The exhibition also includes following groups of works: Swarm paintings, Manipulations of Media and Materials, Nylons, Pneumatic Sculptures, Photograms, Reliefs, Computer Works and Floor Sculptures, Kinetic Sculptures and Motion Photography. Some of the works were created especially for the purpose of this retrospective. 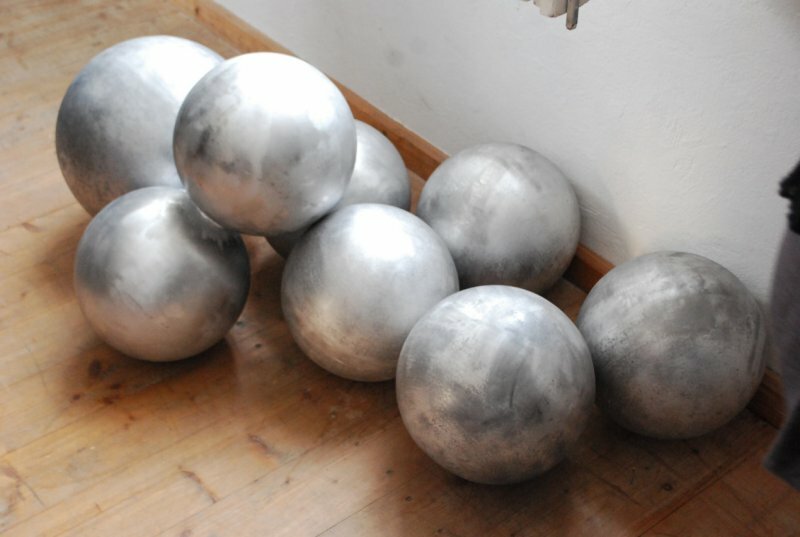 Kupelwieser’s curiosity about the potential of aluminium, aroused after a success achieved with a group of three-dimensional works exhibited at the Viennese gallery Winter in 1984, resulted in a number of tight co-operations with some major aluminium producers in Austria: Neuman in Marktl near Lilienfeld, the VOEST company (for an art project by the Ars Electronica) and the Berndorf AG. 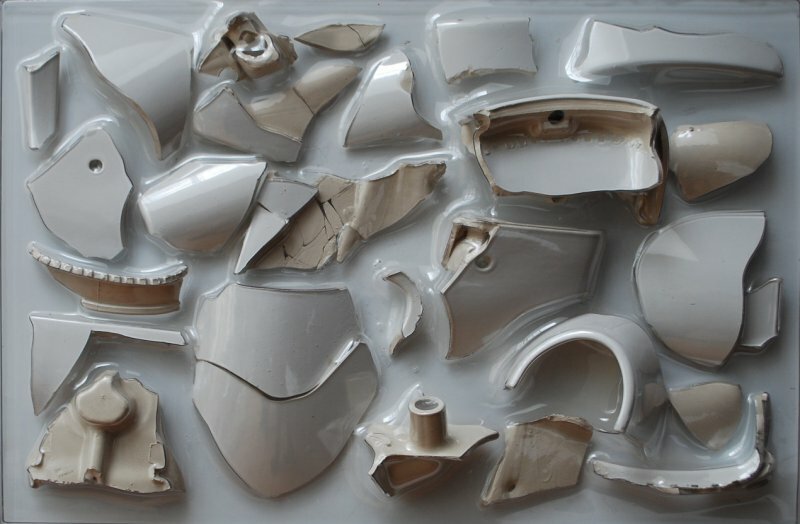 These and other concerns have on several occasions given Kupelwieser the opportunity to work on-site, using the large machines and testing the material to its outer limits. The artist openly admits that working in an industrial firm instead of a studio was of a great significance for his artistic development; for understanding how to deal with materials and how to find new use for them. 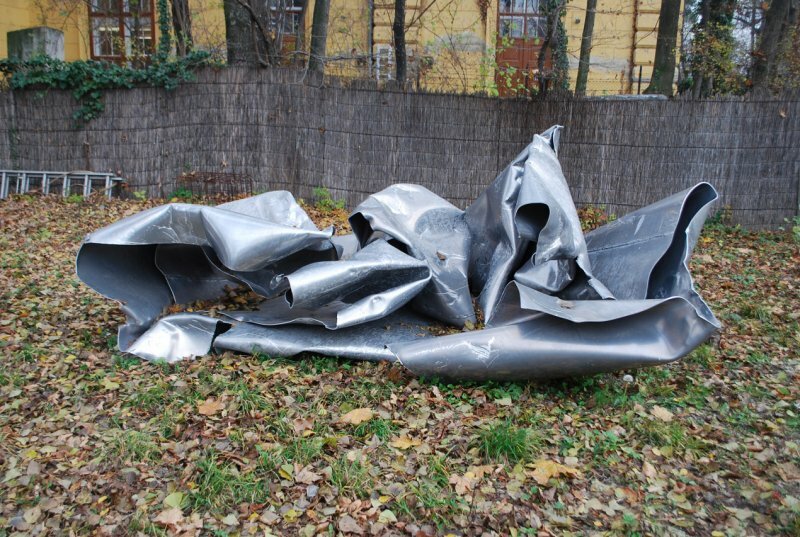 Kupelwieser continues to use large band-saws from some industrial companies to cut his sculptures from different materials: steel, bronze, metal… Some of his sculptures , like the Untitled from 1990 made from high-grade polished steel, are on display in St. Pölten. 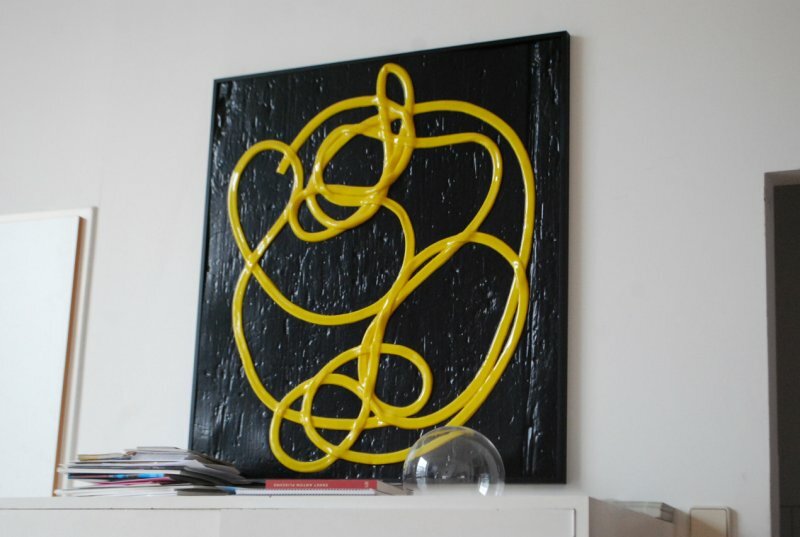 So are some of his famous edge-welded inflated aluminium sculptures Gonflables (most of them produced between 1998-2004): reliefs of randomly intertwined rubber bands, vegetable imprints and typographic pieces cut from metal. 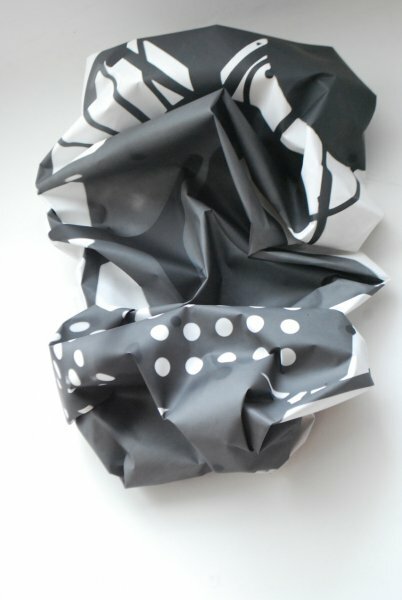 One of the latter which, along with the Folded Coray counts as the central artwork of the current exhibition, is Elliptisch B. Sch (1996) with a rather curious history. 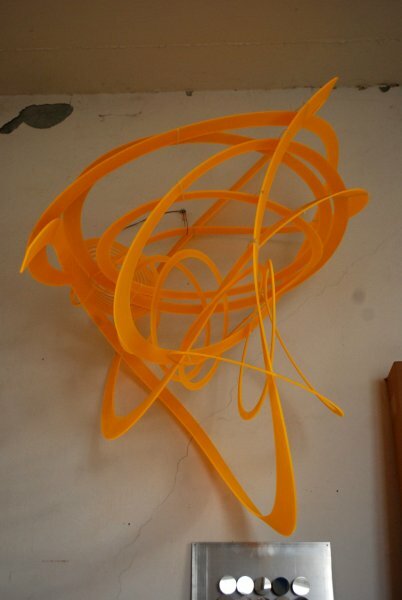 This typographic sculpture was planned for a shown in MAK in 1994, but could not be realized for technical reasons. Because the exhibition catalogue was prepared and written before the exhibition in MAK actually got underway , it contained an essay, by Burghart Schmidt on the non-existing artwork, based on the thorough description provided by the artist himself. 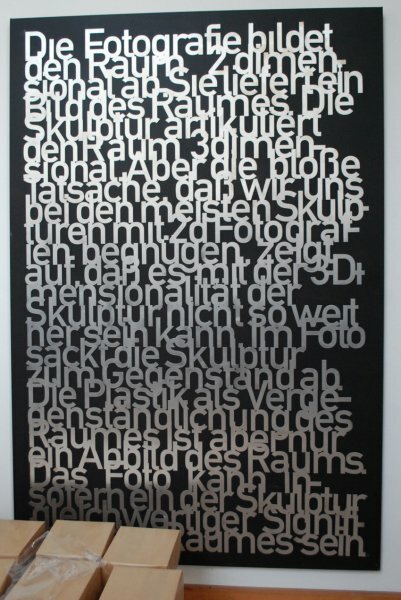 Later on Kupelwieser used Schmidt’s text as a basis for his sculpture, “re-writing” the whole sentences in his work. The work consists of, so to say, its own description, thus becoming very self-referential! It was during an earlier exhibition in Prague (2007) that Hans Kupelwieser, totally by chance, discovered an optical phenomena never before described in scientific books. 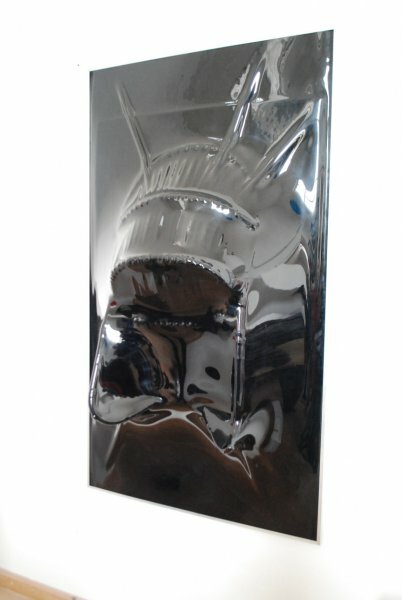 The work K-Effect (2007) – the artist named it after himself – made of stainless steel with a mirror- finish surface was aimed to reflect the exhibiting room. 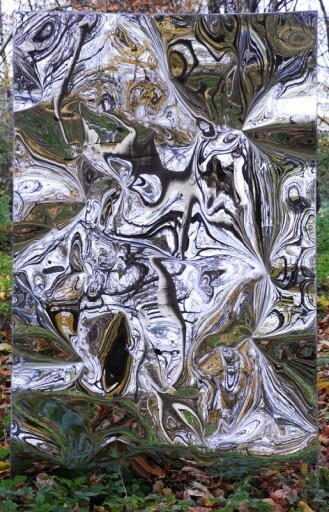 The interesting transformation happened the moment mirror began rotating because it transpired that the image of the room rotated with it. And as if that weren’t strange enough – the image rotated in double speed! Hans Kupelwieser’s retrospective “Reflections” in the St. Pölten Shedhalle is one of our warmest recommendations! It is on display until 27th January. If you miss the opportunity to see the show, we suggest you to have a look at the pictures (or visit) of some the artist’s public projects: lake Stage on Lunz am See (built in 2004), installation Network in the hall of the Schladming Congress Center, and his Memorial on the Jewish Cemetery grounds in Krems. Shedhalle, St. Pölten: Jednog bistrog i hladnog popodneva u novembru 2012, poveća grupa ljudi se okupila ispred kapije Prater studija Ministarstva kulture i obrazovanja republike Austrije, čekajući na kustoskinju Ursulu Mariu Probst da ih provede kroz ateljee mladih ambicioznih- i slavnih domaćih umetnika. Smešten u neposrednom susedstvu Velikog Prater točka na posedu od 25000 m² čija se umetnička prošlost može pratiti do vremena Bečke svetske izložbe iz 1873, ovo je mesto neverovatne lepote na kome stara arhitektura i zelenilo obgrljuju stalno rastuću kolekciju umetničkih dela na otvorenom prostoru. U toj izolovanoj idili, okružen drvećem i cvećem, jedan od najpoznatijih stanovnika BMUKK Prater studija Hans Kupelwieser je radio na svojim bezimenim fotografijama (2010) pejsaža koji se odslikavaju na iskrivljenim površinama skulptura od poliranog čelika, danas deo njegove velike samostalne izložbe “Reflections” u Shedhalleu St. Pölten-u. Na turu kroz umetničke ateljee u Prateru sam se prijavila upravo zbog Kupelwiesera, radoznala da zavirim “iza pozornice” pre odlaska na njegovu izložbu u St. Pölten. Umetnik nas dočekuje u maleckoj bašti ispred ulaza u studio. Pre nego što će nas pustiti unutra, pokazaće na svaku od skulptura raštrkanih po travi, strpljivo objašnjavajući proces njihovog nastanka. Jedan od posetilaca zbunjeno zuri u nešto što izgleda kao metalna lopta koja plovi u zemljanoj posudi ispunjenoj kišnicom. Kupelwieser, očigledno zabavljen ovom reakcijom, ohrabruje čoveka da dotakne predmet: “To je samo šuplji aluminijum. 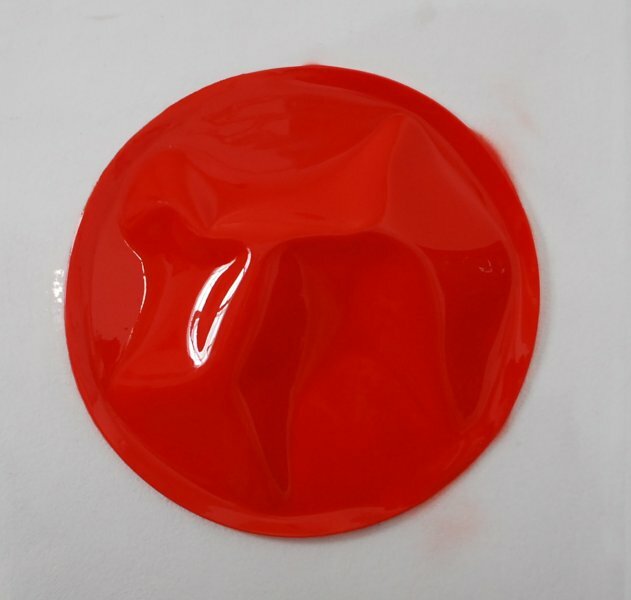 Lak je kao pero!” Unutra u ateljeu shvatam da je kustos nadglasan umetnikom koji je očigledno naviknut da prima i “vodi” goste. Nekoliko dana kasnije, dok se krećem kroz izložbu u Shedhalle, u mislima ću se vraćati na dragocenih sat vremena provedenih u Kupelwieserovom ateljeu. Bez tog iskustva nikada ne bih uspela da u potpunosti shvatim koncept njegovog dela Presavijeni Coray (2008), kompleksnu transformaciju tridimenzionalne stolice švajcarskiog dizajnera Hansa Coraya (1993) u ravnu senku od isečenog aluminijuma, višestruko presavijenu do reljefnog objekta montiranog na zid. Jedna od radnih verzija ovog dela visi na zidu Kupelwieserovog studija zajedno sa primerkom daljnjeg razvoja ovog projekta – Kupelwieser je pomenutu stolicu postavio na rotirajuće postolje ispred uključene kamere koja je beležila obrtaj za obrtajem. Ovaj proces je rezultovao fotografijom samo-objašnjavajućeg imena Rotirajuči Coray (fotografija odštampana mlaznim štampačem na ručno izrađenom papiru, prenesena na aluminijum, 2009) koja pokazuje interesantne promene kontura izazvane brzim pokretom, pri čemu se jedini nagoveštaj o prirodi ilustrovanog objekta nalazi u nazivu umetničkog dela. Hans Kupelwieser se potpisuje i kao kustos svoje solo izložbe “Reflections” koja uspostavlja dijalog između njegovih ranih i najnovijih radova. Posetiocima su pokazana neka od najznačajnijih dela umetnika koji je poznat po svojoj sposobnosti da dvodimenzionalno pretače u trodimenzionalno i obratno kroz eksperimente sa medijima izražavanja, materijalima i tehnikama. Kupelwieser kombinuje kinetičke, pneumatske, arhitektonske i lingvističke elemente stvarajući skulpture, aranžmane, objekte i instalacije koristeći široku paletu prirodnih i industrijskih materijala. Umetnička dela Hansa Kupelwiesera koja se nalaze na displeju u Shedhalle (arhitektonskoj građevini koja se nalazi u sklopu Muzeja Donje Austrije, projektovanoj od strane Hansa Holleina 2002) se protežu od ranih fotografskih radova i eksperimenata sa odevnim predmetima i poliesterom pretvorenih u zidne objekte do njegovih post-medijalnih skulptura i arhitekture. Na izložbi se nalaze i grupe radova: Slike jata riba, manipulacije medija i materijala, najloni, pneumatičke skulpture, fotogrami, reljefi i fotografije pokreta. Neki od radova su specijalno dovršeni za ovu izložbu. Kupelwieserova radoznalost prema potencijalima aluminijuma kao umetničkog materijala probuđena uspehom tro-dimenzijalnih radova izloženih u bečkoj galeriji Winter 1984′ je rezultovala brojnim saradnjama sa velikim austrijskim proizvođačima aluminijuma: Neuman u Marktlu pored Lilienfelda, kompanija VOEST (za umetnički projekat Ars Electronice) i Berndorf AG. Ove ali i druge kompanije su u nekoliko navrata pružile Kupelwieseru priliku da u njihovim fabrikama testira materijale i radi sa velikim mašinama. Umetnik otvoreno priznaje da je rad u velikim industrijskim firmama umesto u ateljeu imao značajan uticaj na razvoj njegovog umetničkog bića, razumevanje materijala i pronalaska nove upotrebe za njih. Kupelwieser nastavlja da koristi velike trakaste testere industrijskih pogona za krojenje skulptura od čelika, bronze i drugih metala… Neke od njegovih skulptura, kao Bezimena iz 1990 koja je rađena od poliranog čelika, se nalaze na displeju u St. Pölten-u, a uz nju i poznate Gonflables (skulpture od šupljeg aluminijuma ispunjene vazduhom, nastale između 1998-2004), reljefi od nasumice isprepletenih gumenih traka, “vegetable imprints” i tipografski objekti od metala. Iza jednog od poslednje-pomenutih – Elliptisch B. Sch (1996) – koji zajedno sa Presavijenim Corayom čini okosnicu aktuelne izložbe, stoji interesantna priča.Ova tipografska skulptura je trebala da se bude gotova za izložbu u MAK-u 1994, ali nije dovršena iz tehničkih razloga. Pošto je izložbeni katalog bio opremljen i odštampan pre postavljanja izložbe, u njemu se našao i tekst Burgharta Schmidta o nepostojećem umetničkom delu, baziran na detaljnom opisu koji mu je umetnik lično dostavio. Kupelwieser je nekoliko godina kasnije realizovao ovaj projekat koji je bazirao na Schmidtovom tekstu, “prepisavši” čitave rečenice u svome delu. Ovaj umetnički rad se takoreći sastoji od sopstvenog opisa! Tokom izložbe u Pragu 2007 Hans Kupelwieser je sasvim slučajno otkrio optički fenomen do tog momenta nikada opisan u naučnim studijama. Umetnički rad K-Efekat (2007) od nerđajućeg čelika i ogledalo-uglačane površine je imao jednostavnu funkciju da u sebi reflektuje izložbenu prostoriju. Do interesantne transformacije je došlo kada se ogledalo zarotiralo zato što se ispostavilo da je sa njim i slika sobe počela da rotira. Da bi stvar bila još čudnija, slika se obrtala dva puta brže od ogledala!